Paddlers hear the roar of Warm Springs Rapid before they see it tumbling through a narrosection of the Yampa Canyon. One of the 10 biggest drops in the West, the rapid is exciting any time of year, but during the spring run-off, it’s a solid Class IV rapid flowing at up to 20,000 cubic feet per second. While the rapids provide a rush, they’re not in themselves the reason this multi-day, permitted run through Yampa Canyon at flood stage is a lifetime paddling achievement. There’s much more to the story than that. The Yampa River is one of the American West’s last wild rivers. Where other rivers like the Colorado or Green River have major water projects that dilute peak flows, these do not exist in the Yampa River basin. This geological masterpiece runs through Dinosaur National Monument, only a three-hour drive west of Steamboat Springs. Slick rock sandstone walls tower at places 1,000 feet above the river channel. Tiger Wall features surreal streaks of black desert varnish known as Navajo Tapestry. It’s tradition for boaters to kiss the wall for luck before navigating Warm Springs, just downstream and round the bend from the wall. 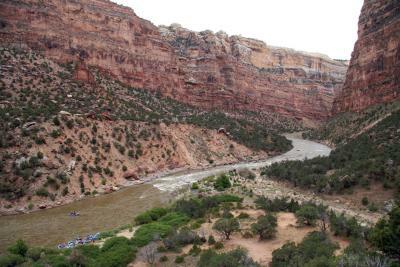 The Yampa Canyon river trip is rated at class I-IV and is suitable for intermediate and expert paddlers. But when the water is cranking, the main rapids, Big Joe and Warm Springs, necessitate qualified boatmen take the helm. Remarkable camping opportunities exist along the lush, greenbelt sliver of habitat on the riverbanks. Harding Hole and Tee Pee camps are two of the best spots to relax after a day of floating. Pitching tents in the fine tan sand under cottonwood trees and cooking up a delicious riverside meal round off the experience that is Yampa Canyon. Secure a permit from the Dinosaur National Monument. They are hard to get and come with a long list of Park Service requirements, including a qualified trip leader, prescribed campsites, fire pan, river toilet and other essentials. The put-in is at Deerlodge Park. There are two take-out spots, one at Echo Park where the Yampa River joins the Green, and the other take-out is at Split Mountain. A trip down Yampa Canyon typically takes 4-5 days, so detailed logistics regarding gear and food are essential. Camp spots are numerous but hard to access, so permits specify exact camping locations. For more information, visit http://www.nps.gov/dino/planyourvisit/riverrafting.htm. An element of adventure adds to the appeal of fishing high-altitude lakes early in the season, when the ice begins to melt. The main challenge is trudging through the snowpack, says outdoorsman Kent Vertrees. “First, you’ve got to get in to the lakes, and there are timing issues about when the ice will melt,” he explains. Kevin Kopischke (and an inquisitive pup) post-holed through waist deep snoto get to this secluded mountain lake, where he caught this 30-inch rainboon a size 20 fly on 5x tippet. Photo by Kevin Kopischke.Veteran fishing guide and avid backcountry skier Kevin Kopischke agrees. “You’ve got to snowshoe or cross country ski to get to the fish,” he says. But that’s part of the fun. In fact, one of his favorite spring fishing trips is bicycling up Buffalo Pass, through the second gate, then hiking and finally snowshoeing to the lake. Fishes’ metabolism slows down during the winter months, and the fish feed almost exclusively on scud, small freshwater crustaceans. “The fish groreally big and really fat,” says Kopischke. 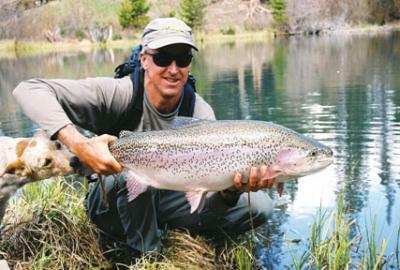 “They look like a football.” Cutthroat and rainbotrout are the principal catch in Routt County, although a couple lakes also have graylings. Being a diehard fisherman may seem like a prerequisite for ice-out fishing, and in some senses, that’s true. Accessing remote lakes can involve crossing miles of rugged terrain and gaining thousands of feet in elevation. But it doesn’t have to be that way. “You can choose a lake that’s a half-mile in, instead of 10 miles,” Kopischke says. The best spots for ice-out fishing change with the altitude, snodepth and season. Stagecoach and Sheriff reservoirs melt in April or May some years. Other lakes in the Flat Tops and Zirkel wilderness areas may still be covered with ice in late June. The best bet is to inquire at local fly shops, and unless your destination is not far from the road, take along a friend. “It’s more fun when you have a buddy anyway,” Kopischke says. Champagne and roses awaited Mary Ellen Shaughnessy and her six hiking companions at the end of the Colorado Trail. The posse of 50- and 60-year-olds completed all 483 miles of the trail, which runs from Denver to Durango and connects scenic highlights of a state famed for its mountain splendor. They dodged lightning bolts, tripped through technicolor wildflower fields and stood atop summits along a high-altitude tour de force that averages over 10,000 feet in elevation. But upon reaching the terminus, Mary Ellen felt a twinge of sadness at seeing their “Rocky Mountain High” come to an end -— at long last. The feat took the women two summers to complete. Instead of thru-hiking the trail in one four- to six-week span, they hiked it in segments, starting on May 11, 2009, and finishing Aug. 5, 2010. After committing one week of every fair-weather month for two years to the venture, they were chomping at the bit to complete their goal. Breaking up this legendary hike made it more accessible, since no one had to leave jobs and families for a month or more. Because Mary Ellen’s husband, Jim, drove a “sag wagon” to trailheads and road crossings, the women day-hiked most of the miles and spent nights in hotels. “Anyone in modest physical condition can do it and enjoy it,” says Sherry Benson, who hiked and cycled to build fitness for her Colorado Trail segments. Fellohikers, locals Sue Swain, Pat Rice, Marilyn Palmer and Louise McLeod, and Monique Mustard of Frisco also trained for the trail. “Getting a consensus among seven women is always interesting,” Sherry jokes. But the common goal drethem together, so that what began as Mary Ellen’s idea greinto a shared vision. “We were amazed at the richness the Colorado mountains have to offer,” Sherry says. 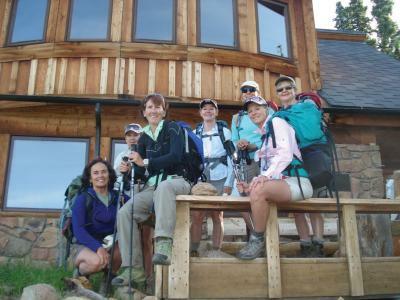 For more information, visit www.coloradotrail.org Colorado Trail hikers: Back row: Pat Rice (kneeling), Louise McLeod, Mary Ellen Shaughnessy, Sherry Benson and Marilyn Palmer. Front Row: Monique Mustard and Susan Swain.